A well-constructed fence, when properly installed, provides a safe haven for children and pets. It protects your yard or pool, and adds value and beauty to your home. Dynamite Fence Company takes pride in the wide range of options we offer for residential fencing. Select from chain link or custom wood fences as well as ornamental aluminum or steel fences. If you prefer galvanized and vinyl-coated chain link options or the durability of PVC vinyl fencing, Dynamite has just what you need. Our experienced professional team can even design and install your automated home gate system. When considering a fence, you’ll want to consider the quality of the materials, the reputation of the company, and the experience of the estimators and installers. There are many benefits to owning a fence. What sets Dynamite Fence Riverview apart from others is our solid reputation, backed by over 25 years of experience. We use only the best materials. Our staff works with you to ensure that the fence we build meets your expectations. Our professional installers have the knowledge and experience, show up on schedule, work efficiently and clean up when the project is complete. If you want the highest quality PVC, vinyl, aluminum, steel, chain link or wood fencing materials and installation, you want a Dynamite Fence! We are now serving the greater Holiday area with competitive pricing and top notch custom wood fence, PVC, vinyl, ornamental aluminum fencing & chain link installations. We understand that a fence is a big investment and that it should be something you can be proud of for years to come. We take time to understand your fencing needs and custom tailor our installation to provide what each individual customer wants. We also believe buying a fence should be a pain free process. If you are looking for Picket Fences, Rail Fences or Privacy Screening we provide a variety of options in Wood or PVC Vinyl. Our Ornamental Fencing is available in Aluminum or Steel and is maintenance free option. Whether you are looking for a fence to add some privacy, or to define your yard, or to keep your pets and children safely on your property, we are the Riverview fencing company you can always count on. We offer sturdy construction and fast installation to keep our Riverview residents happy and satisfied. Gates, Arbors and Pergolas are designed and built by our Dynamite Fence Company Team of Experts and can be incorporated into you existing landscape. 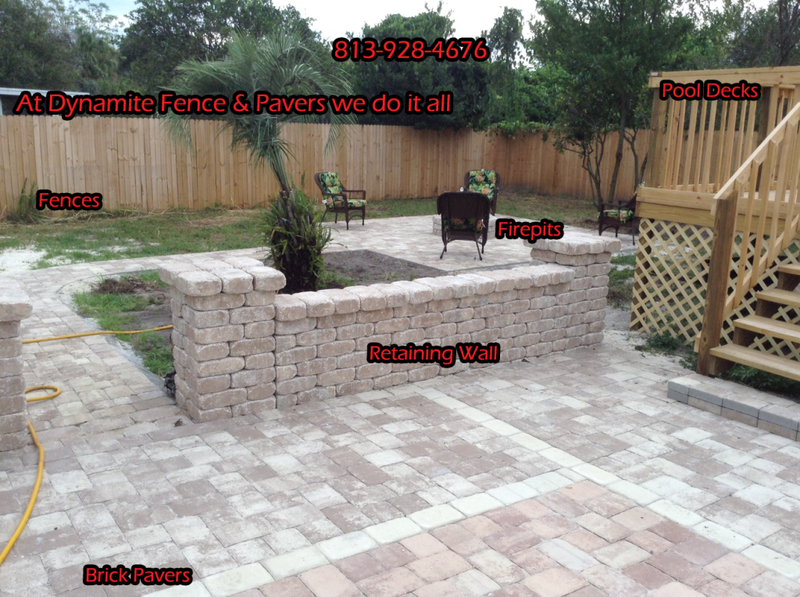 Take a look around our site and you will see why we are the best fence Company in Riverview for fence and gate installation. Still not convinced we are the best Holiday fence company? Check out our reviews and other projects we have completed in the past below.